A feisty young debutante is kidnapped by a brooding duke with bewitching green eyes and his league of roguish friends in revenge for her uncle's financial scheming against the duke. A young woman embraces the Christmas spirit and decides once and for all to seduce the man she's loved all her life, her brother's best friend, an infamous member of the League of Rogues. 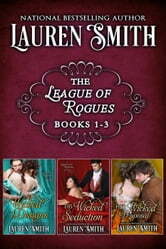 An heiress desperate to escape fortune hunters after her father's death, proposes to the one man she can trust, the recently blinded golden boy of the ton, and a member of the League of Rogues.